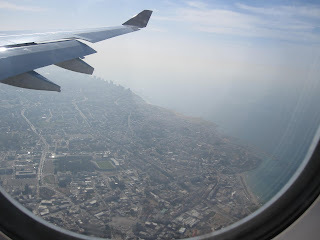 ...although not quite long enough as I was in the middle of (embarassingly) enjoying the movie Julie and Julia when we touched down. We are spending a fair amount of time dealing with logistics of the trip. Two consecutive car rentals, several tour guides, 8 peoples' needs and desires, 11 hotel room bookings, meetings with 7 or so different family/friends groups. Everything constantly needs to be modified, negotiated, confirmed, reconfirmed. Haggling with a tour guide / driver to take our group around Israel did not go well (his price went UP about 20% until we gave up and parted ways). Maybe I should've used a travel agent this time. I have recently become actively involved in genealogy, sparked by trips to the villages in Ukraine and Hungary where 3 of my great-grandparents were born, and exacerbated by how accessible information is through the computer -- and I DO spend an awful lot of time on the computer. I recently met online a man George who was born in the same village as my great-grandfather - and has the same last name as that great-grandfather's mother. We haven't been able to find a family connection, but we have become online penpals. 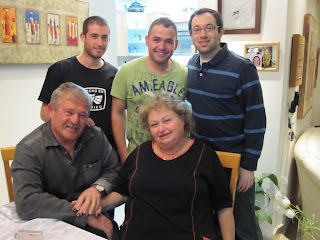 Friday we had Shabbot dinner with George's sister and family, who live near Kiryat Malakhi, Israel. They live on a Pomegranate (they call it "grenade") farm about an hour south of Tel Aviv. Dinner was delicious - starting with a sweet potato soup and chicken noodle soup - and leading into several courses of chicken entrees. For dessert we had the last batch of pomegranites they had harvested in the fall - yum!! !